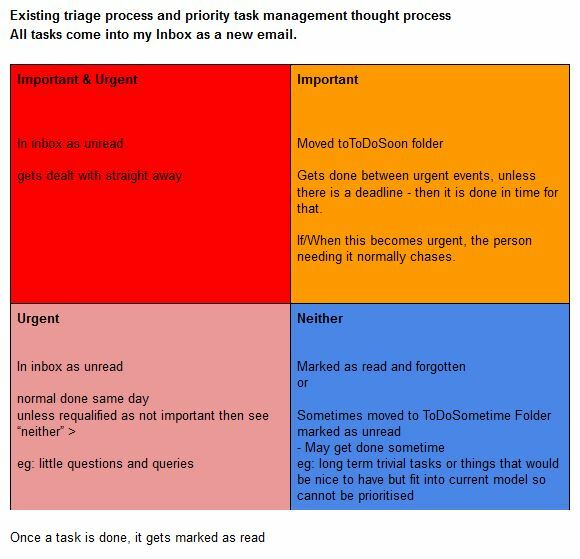 After reading Remy’s post “Yesterbox” on Emailblog.eu I remembered about a little chart I made ages ago to demonstrate how I’d triaged my inbox as a low level task manager. In order to help add context to the emails I use the Thunderbird extension: Message Notes Plus. It’s a simply little thing that lets you add notes to an email. Early on it allowed you to store the text file where the notes are stored and referred to in a network folder so more than one person could use the same notes, this really helped in the early days when we had a team of people all using the customer services inbox, we moved to Zendesk long ago now and the extension wants money for the networkable version now too. To an extent I still use it today but for far less important tasks, much of my work flow relies on multiple people etc. so it gets a bit ganty. At the time it was quite popular with other people with the same workflow, most people tend to have the important/urgent thought process but just don’t realise it. The only browser plugin that’s ever got close to being useful was ActiveInbox which is a chrome plugin for Gmail, unfortunately it was so unreliable I had to knock it on the head. Maybe once Google gets around to the promised improvements to Google Tasks something might be useful for me?